For those unfamiliar with the Big Bend area of Texas, it’s called the Big Bend for a good reason. The changeable ribbon of water that separates the United States from Mexico is the Rio Grande, the great river. To Mexicans, it is known as El Rio Bravo, a fearsome, rushing stretch of water to be revered. Just 118 miles due south of Alpine, the 1,900-mile Rio Grande diverts itself from its southern course to a sudden big bend toward the north, giving Texas its uniquely unmistakable border. 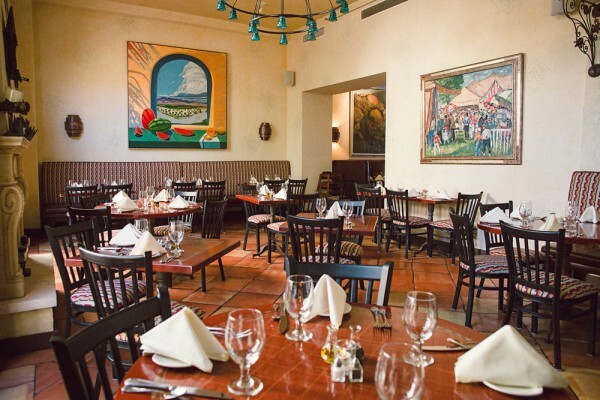 In tribute to the river, the grand dining hall of the Holland Hotel is the Century Bar & Grill’s Rio Grande Room. The spacious setting has ample seating for 40 and is decorated in the classic style of the Southwest, a blend of cultures represented by some of the six flags that once flew in succession over the State of Texas. The furnishings are reminiscent of a Mexican hacienda, the artworks with which the dining room is ornamented are by Big Bend regional artists, and the grand arched doors that open out onto the airy romance of the terrace are French. Immerse yourself in the atmosphere of an earlier time where cultures and friendly neighbors mingled in common over a fine wine and a good meal in the Rio Grande Room in the Century Bar & Grill.